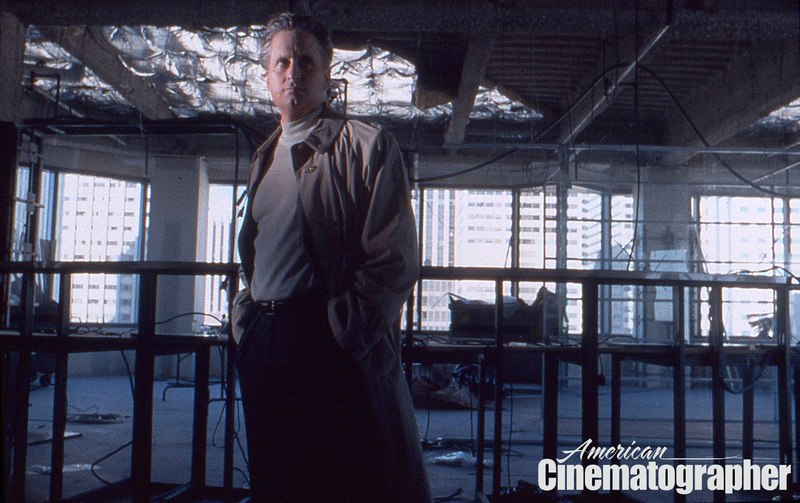 Wealthy San Francisco entrepreneur Nicolas Van Orton (Michael Douglas) is drawn into nightmarish world of paranoia in the inventive thriller The Game. 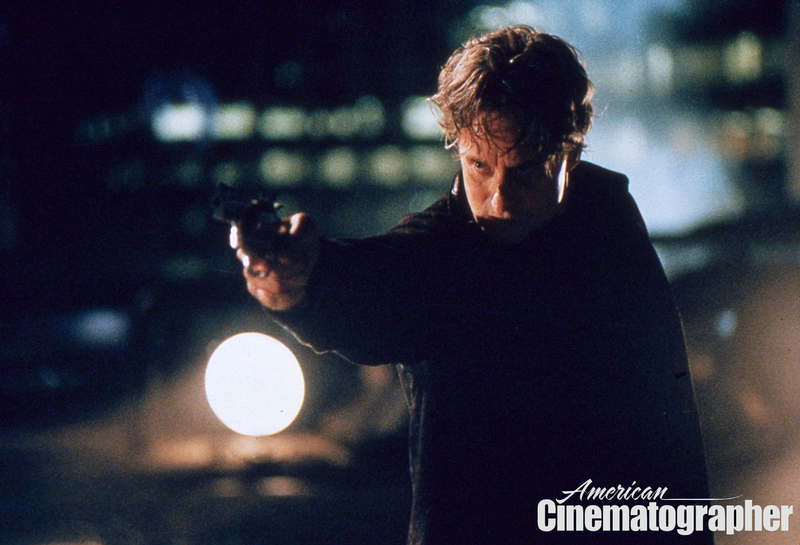 Directed by David Fincher and photographed by Harris Savides, ASC, their 1997 feature The Game paid homage to the paranoid thrillers of the 1970s. 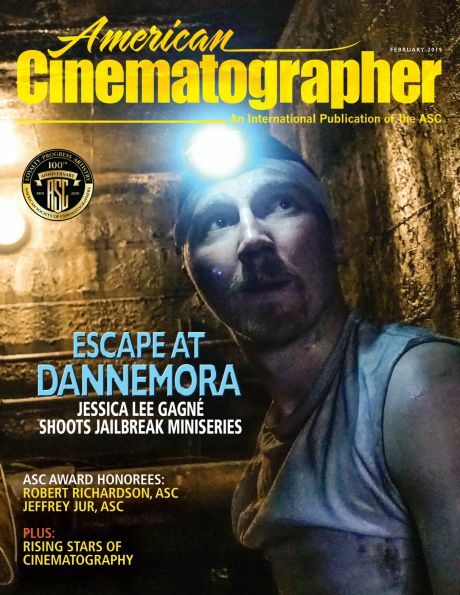 "The Game is not a big action film," the director told American Cinematographer. "It is much more of an intrigue movie. If the movie is about anything, it's about loss of control. We wanted to create an experience for the audience that didn't seem contrived, even though it is quite contrived." "David is very clear about what he wants and he has a great eye," Savides noted to AC. "I've learned a lot from him. 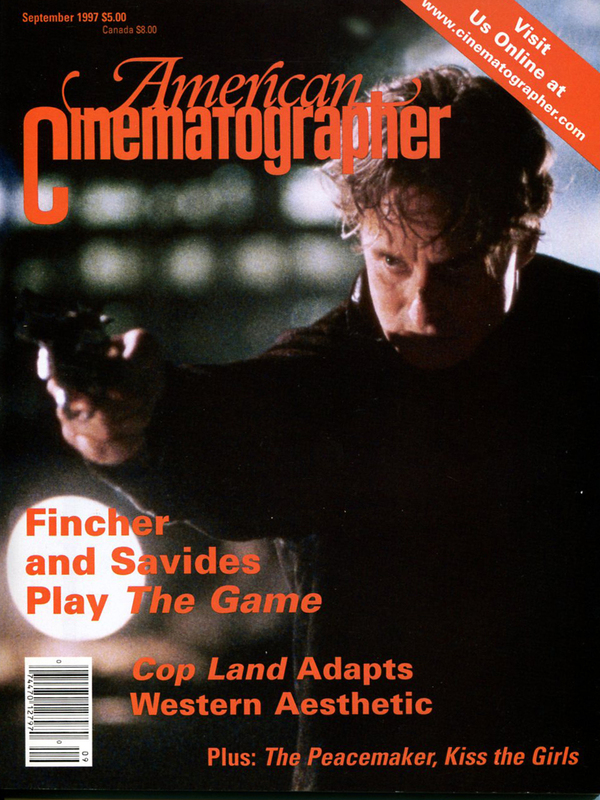 He's not like a lot of other directors, who sometimes let their cinematographers run away with things. He has very definite ideas about camerawork." 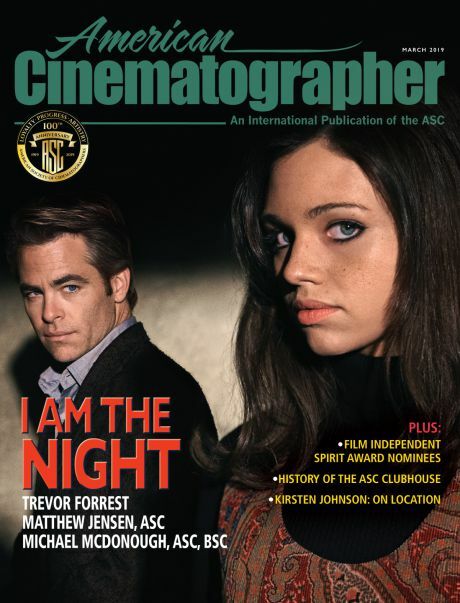 Key crew members on the show included gaffer Claudio Miranda — who would later become an ASC member — key grip Michael Coo, and second-unit director of photography Jeff Cronenweth — who also later joined the ASC and would go on to shoot several subsequent features for Fincher: Fight Club (1999), The Social Network (2010), The Girl With the Dragon Tattoo (2011) and Gone Girl (2014). Fincher and Savides would reteam to shoot the chilling and exhaustive thriller Zodiac (2007). 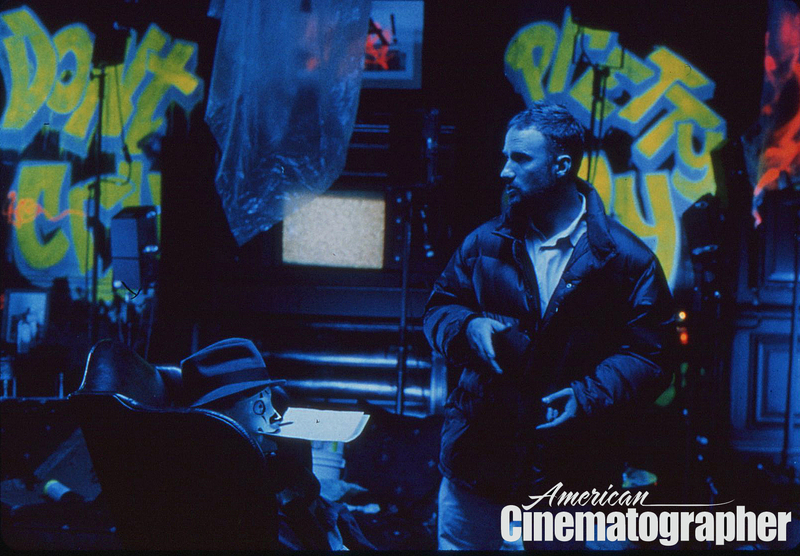 The cinematographer, also known for his work in Heaven's Prisoners (1996), Illuminata (1998), The Yards (2000), Birth (2004), American Gangster (2007) and Milk (2008), died in 2012 at the age of just 55. 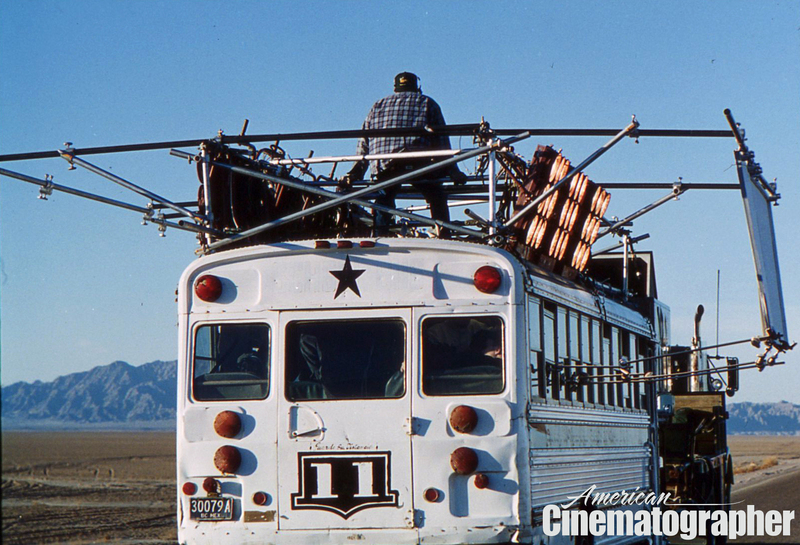 This selection of production stills shot by unit photographer Anthony Friedkin reveals some of the efforts the filmmakers made while shooting The Game almost entirely on location in San Francisco and Mexicali, Mexico, with additional stage work in Los Angeles. Cinematographer Harris Savides, ASC checks his light. 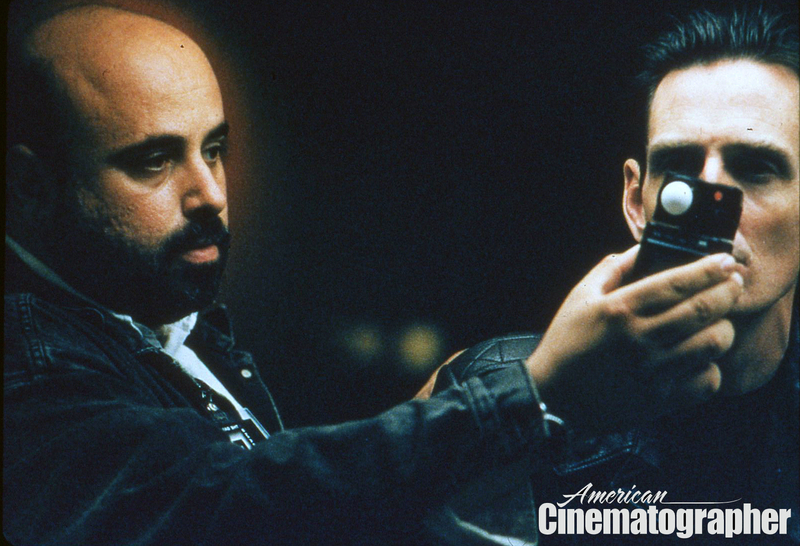 Consumed with the film's complex narrative, director David Fincher entrusted Savides fully with the look of the picture. 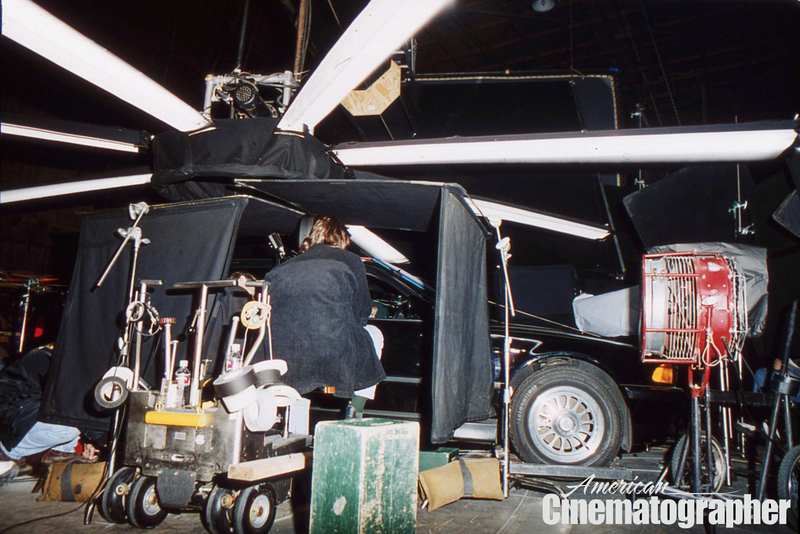 Panavision provided blacked-out GII and Platinum cameras to help avoid reflections in windows and other surfaces. 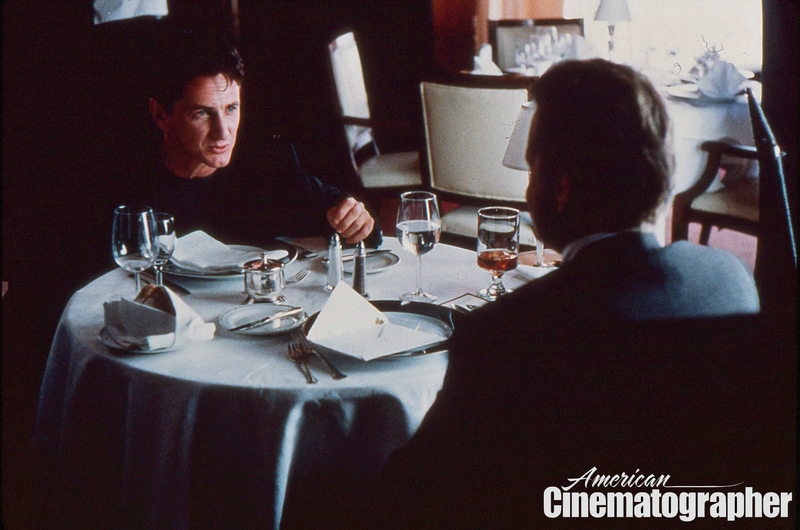 Van Orton has lunch with his mysterious brother, Conrad (Sean Penn) in a scene filmed at The City Club in downtown San Francisco. 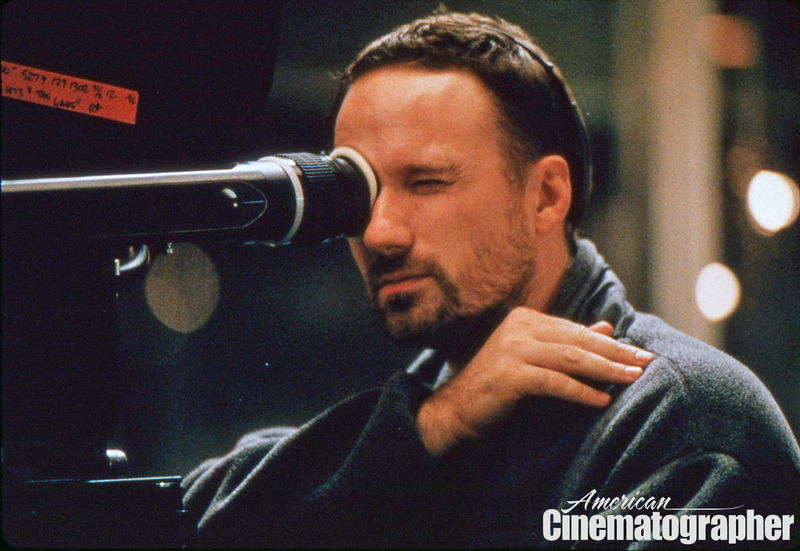 The use of Fincher's favored 27mm lens required the filmmakers to replace the standard 54" table with a 29" version to keep the characters close together and the scene intimate. 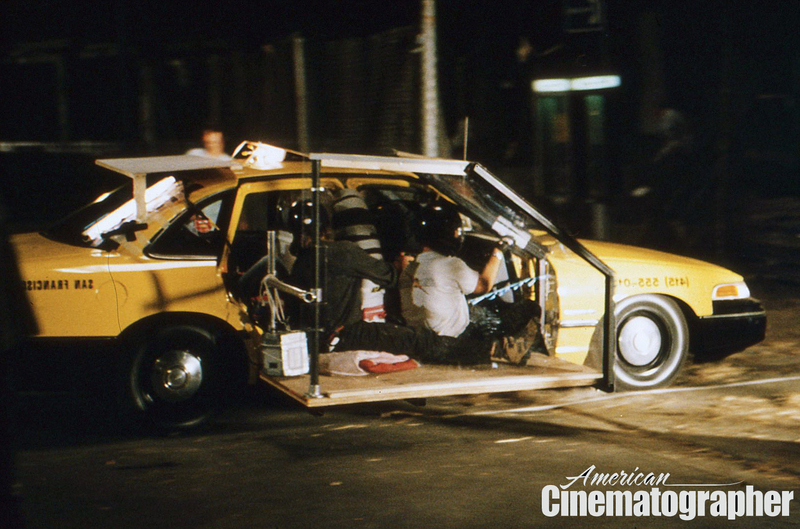 The film was shot almost entirely with 27mm, 40mm and 85mm Primo lenses. 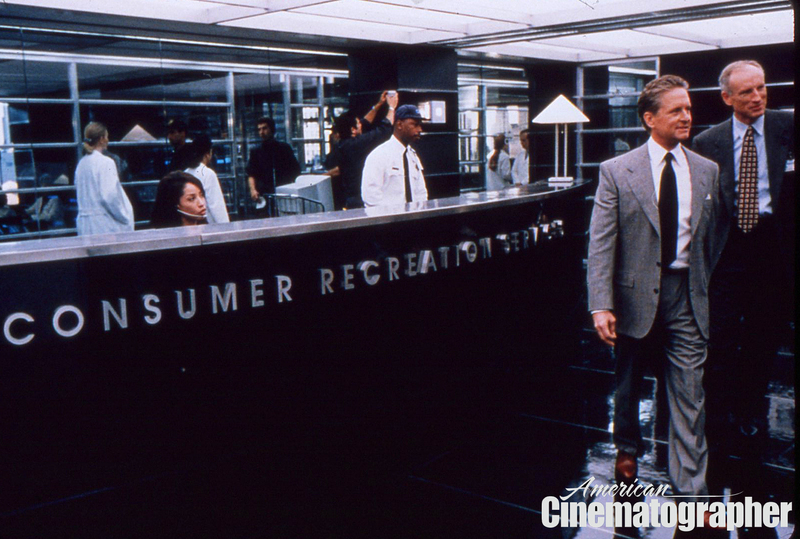 The Consumer Recreation Services (CRS) offices set was built in an actual San Francisco office space. The shady company is about to make Van Orton's life "interesting." 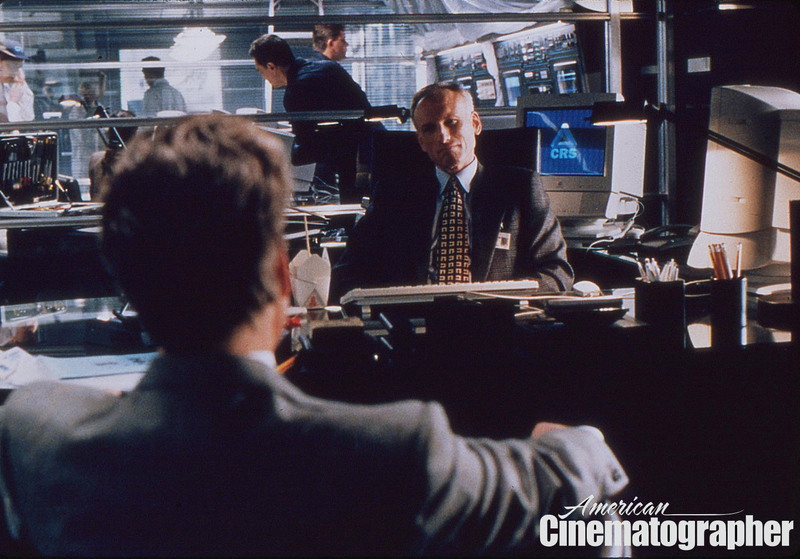 Van Orton meets with CRS account manager "Jim Feingold" (James Rebhorn) — who ends up as another mystery. The sleek CRS offices contrasted nicely with Van Orton's luxurious, traditional home. Soft toplight gave the set a modern look. Van Orton discovers that the CRS headquarters was nothing but a sham. Van Orton is surprised to find his opulent home tagged by CRS operatives — actually production and graffiti artist Vince Moisden. 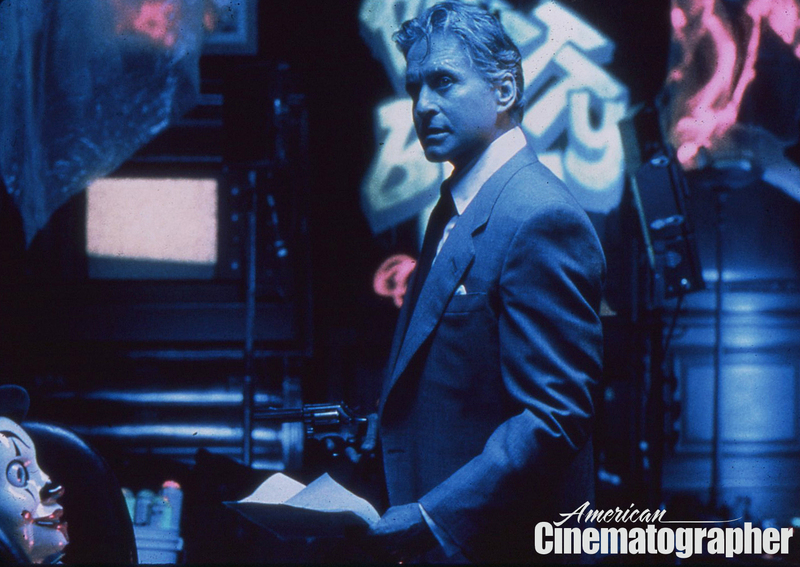 The Wildfire UV paint was illuminated by Black Moon UV fixtures and Super Blue Kino Flo blue screen lamps. Fincher inspects the UV-graffiti-covered room on location in the Filoli mansion — a famed landmark estate just outside of San Francisco — standing in as Van Orton’s mansion. 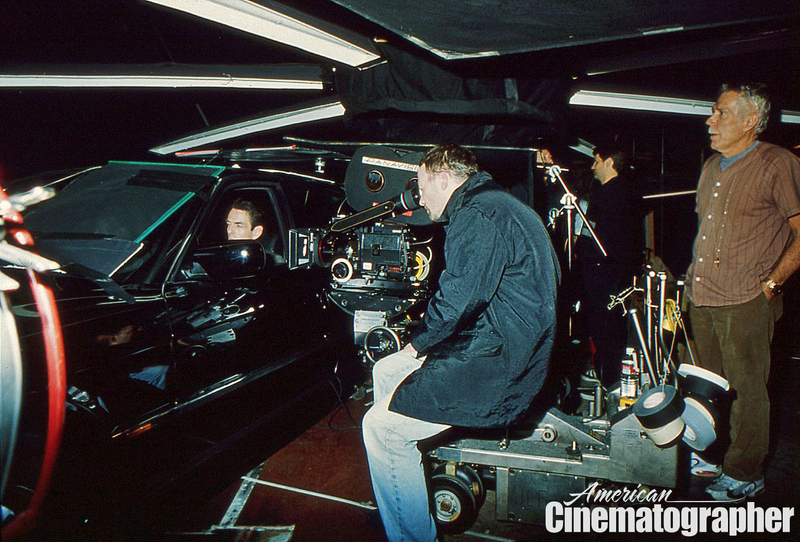 Fincher takes a look through the eyepiece while shooting car work employing a helicopter-like lighting rig in conjunction with rear-projection using VistaVision plates. 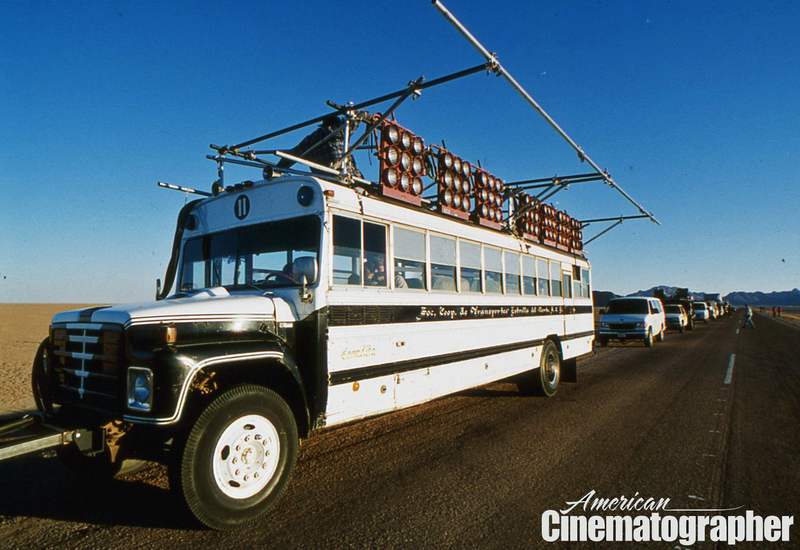 The rig was built by gaffer Claudio Miranda, who later became an ASC member. 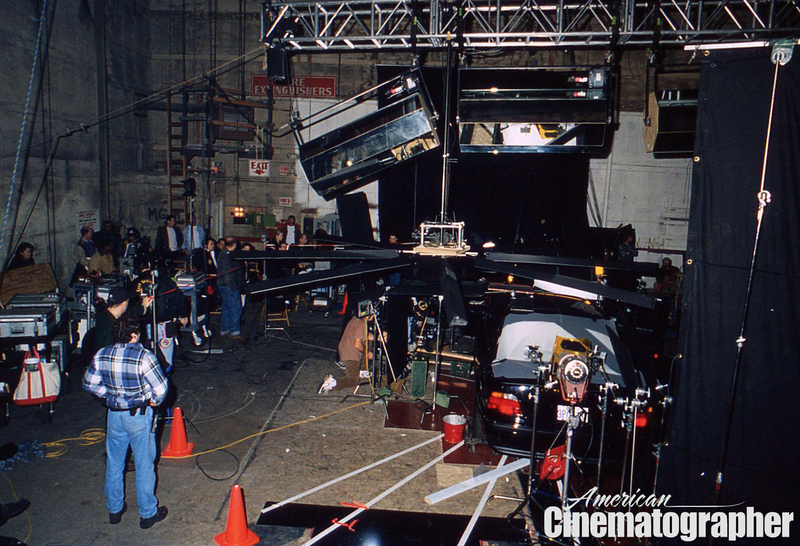 Another view of the car rig built by Miranda, who noted that it was one of the most expensive he'd ever constructed. It primarily employed 8' Kino Flo tubes projecting from a 2' center hub, spun by a brushless motor. Another view of the process lighting rig. Finding himself kidnapped and dumped in Mexico, Van Orton rides home in a dilapidated bus. 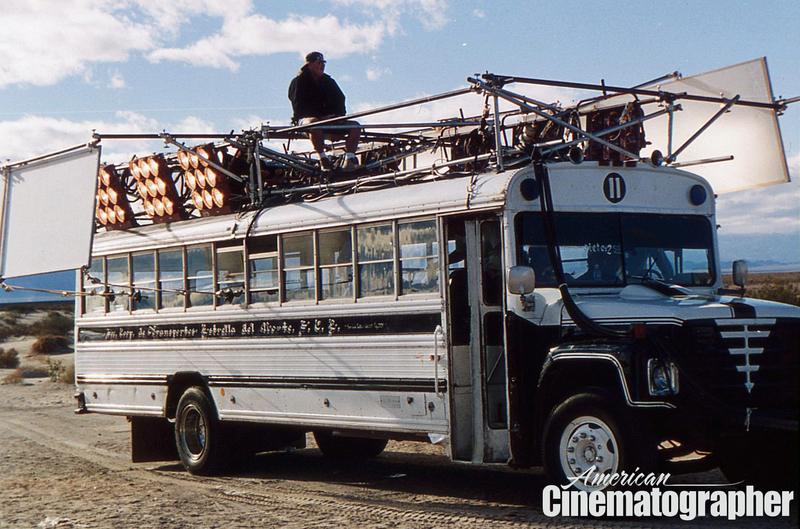 Savides asked gaffer Miranda and key grip Michael Coo to rig the vehicle with Maxi-Brutes bouncing into Luann panels. Another view of the Miranda/Coo bus rig. Setting up the bus rig, with the production caravan stretching into the background. This car-mount rig built for a race through San Francisco after Van Orton is kidnapped by another CRS agent posing as a cabbie. 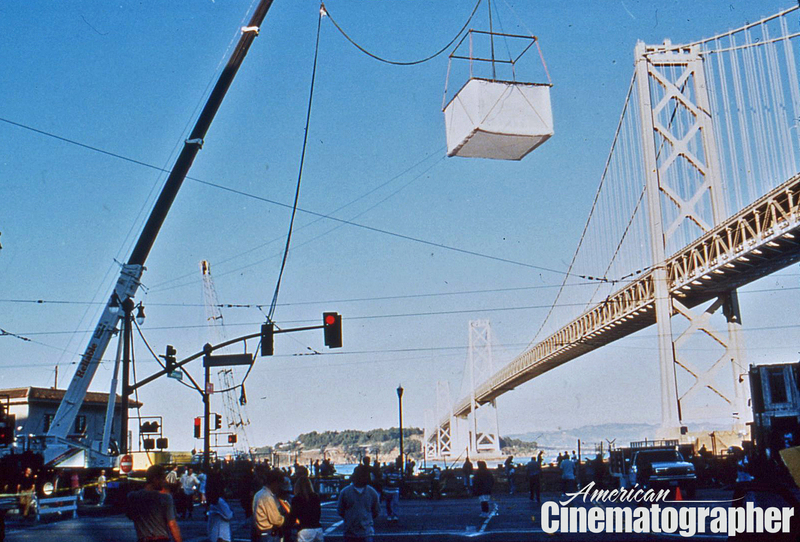 For a scene in which Van Orton's cab plunges into the San Francisco Bay, Savides used a custom 40'x40' moon box containing 25 space lights. It was suspended 100' above the ground with a construction crane. It was used not as a direct source, but just to build ambience. 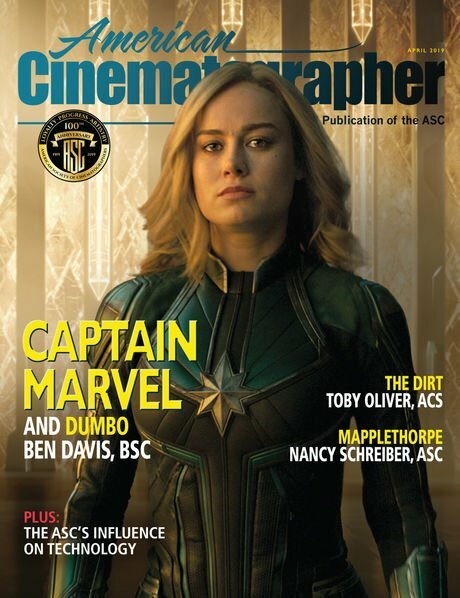 A digital copy of AC's complete feature story on the making of The Game, featuring Fincher and Savides discussing their work, is available here.